Alex Mowatt, who went closest to a goal for Leeds United. Leeds United have dropped down to 19th in the Sky Bet Championship after suffering their first home defeat this season under Neil Redfearn. A single goal on the hour from Hugo Rodallega proved enough to condemn the Whites to a 1-0 defeat against Fulham. United started well enough and were unlucky not to be in front by half-time after hitting the woodwork. It took Fulham 45 minutes to make home keeper Marco Silvestri pull off his first save, but once they went behind Leeds rarely looked like getting anything out of the game in the final quarter. United played some decent football in the early stages and came close when full-back Sam Byram got round the back of the visitors’ defence only to see his angled shot flash just wide. A number of good positions were squandered with poor final passes and Fulham survived. But the Londoners were lucky on 29 minutes when Alex Mowatt’s header came back off the crossbar and hit keeper Gabor Kiraly only to somehow bounce to safety. At the other end Lasse Christensen’s shot from outside the box was well blocked before Mowatt had space to shoot outside the box for Leeds, but sent his strike wide. Byram got forward again and saw his shot saved at two attempts and it remained 0-0 to half-time with Seko Fofana finally getting a strike on target for Fulham only for it to be comfortably saved by Silvestri. The second half started in lively fashion with action at both ends. Fofana’s shot from the edge of the box was well held by Silvestri then former United favourite Ross McCormack, who had a quiet first half on his return to Elland Road, went round Mowatt with ease only to see his low cross evade his fellow attackers. Adryan tried an overhead kick for Leeds following one of several Warnock overlaps down the left and Byram sent an ambitious volley just over following a good move. The deadlock was finally broken on the hour when Christensen got round the back of the home defence and his low cross was turned in from close range by Rodallega. 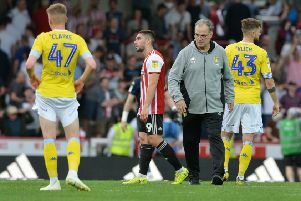 Head coach Neil Redfearn responded by throwing on Billy Sharp for Souleymane Doukara and the team initially responded well to going behind with Sharp producing a great cross that Adryan somehow missed as he went to head in with keeper Kiraly flailing and unable to get to the ball. But Fulham saw out the pressure and began to look dangerous on the break with United over committing to attack. One such break saw Rodallega through on goal, but he blasted a great chance wide. He also sent a tame header straight to Silvestri while Leeds huffed and puffed, but produced nothing in attack in the final 20 minutes and were booed off by a section of the 27,264 crowd at the end. Head coach Neil Redfearn, who had named an unchanged line-up from the one that lost 4-1 at Ipswich last week, was unhappy with the display . He said: “The performances at home have been good, but this is a step back for us. “It’s disappointing because we had some momentum at home and we’ve been scoring goals. “We had enough opportunities in and around their box and passed it well at times, but we looked tentative in the final third. “If Alex Mowatt’s header in the first half had gone in I think we would have gone on to win because we were in the ascendancy. It was a great header, but it was a good save as he’s tipped it onto the bar. Leeds: Silvestri, Byram, Pearce, Cooper, Warnock, Bianchi, Cook, Mowatt, Adryan (Dawson 76), Doukara (Sharp 61), Antenucci. Fulham: Kiraly, Grimmer, Hutchinson, Bodurov, Stafylidis, Christensen, Hyndman, Fofana (Zverotic 84), Ruiz, McCormack, Rodallega (Woodrow 81).